I had told my friends for a few years that I wanted to move to New York. At the time, I was working as a photographer in Santa Barbara and was doing well photographing weddings, shooting head shots, family photos, and students around town. I started visiting New York a couple times a year and every time I went I saw so much potential in the city. The city was home to modeling agencies, advertising agencies, creative agencies, magazine headquarters, and every big name photographer who was shaping the industry. In Santa Barbara, I was a medium sized fish in a small pond. But in New York, I had the chance to be a small fish in a very big pond and then grow into that. I had the potential to become a great photographer instead of remaining a mediocre one. 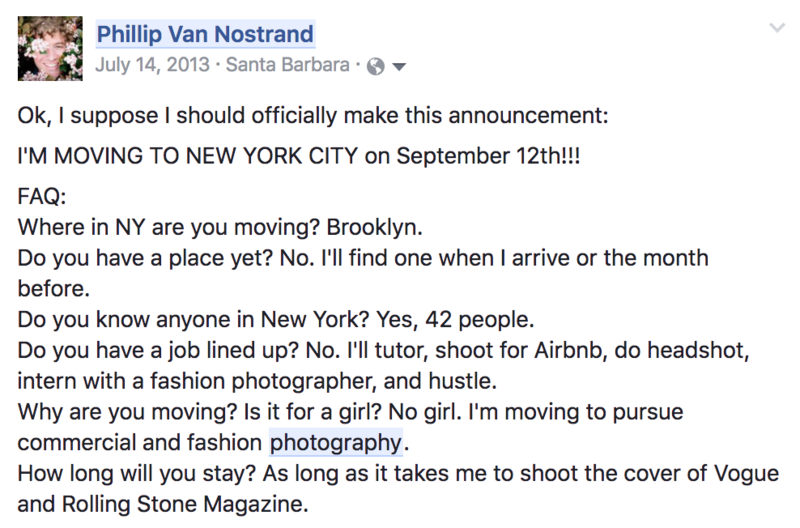 After a year or so of saying that I was going to move to New York, I ultimately realized that nothing would make me ready to go. I just needed to do it. There was no right time. There wasn’t going to be a good time to move to New York. Just like there’s no good time to quit your job or break up with someone. Whether I moved in five years or the next day would have meant the same thing for me. Either way, I had to leave what was comfortable and familiar and try to make it happen in a new place. The idea of waiting for the “right” or “perfect” time to do something is a myth and I stopped buying into it. So I bought a one way ticket for $180 with six months to spare and made all the preparations for my move to New York. So I want to invite you along on my journey, and this blog will be complete when I shoot the cover of Rolling Stone. I showed up in New York with two suitcases, a camera backpack, and a laptop bag. I found an apartment online and on paper it sounded like my dream place. It was an old warehouse converted into a loft with floor to ceiling windows, natural sunlight, and a bunch of Brooklyn creatives living there. Perfect, right? In reality, it was 8 people, two dogs, and one bathroom. There was no space to photograph because they had built out so many rooms and there was nothing left of the living room to shoot in. My bedroom was six feet tall and the top of my hair would brush against the ceiling. My door was a made of plywood and I used a piece of string wrapped around a nail to keep it shut. I only lasted 3 weeks there. I ended up finding a cheaper place with more space a little further away where I actually lived for the next two and a half years. It was an excellent Welcome-to-New York story. Before I came out to New York I had made a list of all the friends I knew, all the friends of friends in New York, and every other connection I could think to make. I had individually emailed about sixty people before I got here. I got to New York excited and with enough goals to keep me busy. I tried to meet at least one new person a day, I started an internship with a commercial photographer, and was photographing for Airbnb to pay the bills. Create a network of connections in New York. Create an online mentorship program. Cultivate a bi-coastal lifestyle of work and living. Have a community of friends. Create a name in the commercial or fashion industry. Gain commercial clients in NYC. Get paid to shoot wedding abroad. That first year I probably accomplished about half of those goals and since then I’ve been able to accomplish even more. Setting goals has always been important for me. It keeps me motivated and I always have something to do or work on. Breaking into any industry is hard. It takes time to make connections, learn the ins and outs of the business, and get people to trust and hire you. The best thing I did in my first year in New York was to take on a mentor and intern with him once a week. He was connected to the world I wanted to be a part of and I learned very quickly how it all worked. I got to see how he shot, operated his business, interacted with clients and all the basics to commercial photography. I learned how to set up lights and handle studio equipment. I helped my mentor build out his portfolio book and I watched him grow his email list and contacts, and a bunch of other things that I have since started doing as well. One of the biggest things I learned that first year was how commercial photography actually works. I had a lot of questions before moving to New York, like: If you drive through the city and see a billboard or ad, how does that picture get there? How is a photographer hired for that? What does that process look like? I learned how all of that is accomplished, how to get my name and face into these agencies, and how to get hired for the jobs. Doing all of that is a long term game and I’m only partially there. This blog will chronicle that story. This is the story of how I got published in the New York Times in my first 100 days of living in New York City. I had a friend in a dance company that performed this magical burlesque Nutcracker performance. The director needed some promotional material and I offered to shoot the show for $300 and two tickets to attend. So I edited twenty images on the spot, sent them to him, and hoped they liked the photos. And now I get to say: Within three months of moving to New York I had an image published in the New York Times on the front page of the Art & Culture section. I’m a New York Times published photographer. This awesome achievement occurred largely because I was in the right place at the right time, and it happened because I was in New York, not Santa Barbara. If you’re thinking of moving, or quitting your job, or pursuing your dream, just do it. The best way to do something hard like this is to make the decision and buy the ticket (whatever that looks like for you). Then work out the details afterwards. It’s a myth that you need time to work things out. If there’s one thing I wish someone had told me when I got off the plane in New York, it’s this: Keep doing what you’re good at. For me that meant my natural outdoor photo style was a strength, not a weakness. When I first got to New York I spent some time trying to do high fashion shoots in studios with models and crazy makeup. I was trying to do what I thought I should be doing but it really wasn’t my style. I work best in natural light, shooting environmental portraits. I thought that was a weakness and I needed to be doing something else, but it wasn’t. There is a place for me in the commercial and fashion world, doing things exactly how I did them best. I can see my photo style in Anthropologie magazines and Levi’s ads, on bank displays on the corners of Manhattan blocks. My strengths aren’t weaknesses and neither are yours. You just have to learn how they work for you. Next month I’ll tell you about my second year in New York, why my mentor and I broke up, how I started shooting commercial gigs, how I attended and shot Fashion Week. I’m excited to share this journey with you. These posts are more than just the narrative of making it and shooting the cover of Rolling Stone (even though that’s still the goal). This story is every person’s New York Dream. This is such a great read!! Back in Santa Barbara, I remember when your shared your brilliant goal of Rolling Stones. I thought what a grand goal. Seeing your journey this last year makes it ever more inevitable. Keep on sharing the journey. Awesome, Phil! Loved reading this. So great to hear your story. You have a real flair for telling us about how you have been going about creating your life. It must be your Toastmasters training . Thanks for sharing your journey. I like what you said about doing what you are good at and like to do. I would add to that, be the person you would like to be while you do it. We just got back from Live Oak Music Festival and I still remember you camping with us. Seems like a long way from New York City, but I really enjoyed your company. 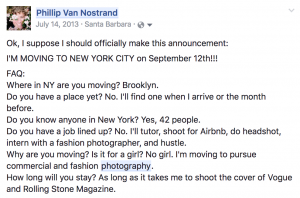 Get famous and I can say that I couch surfed on Phillip Van Nostrand’s couch back in the day. It’s good to hear from you. Exciting and challenging journey, remembering every step and feeling on the path. How inspiring and encouraging this is for me , to set great goals and really go far to reach them. Best wishes you fabulous soul in a fabulous city, can’t wait to read more !!! Thank you so much, Annette! I love that you all are cheering me on 🙂 I feel the Toastmasters love! I miss you. Hope you are doing GREAT.